Christmas is traditionally a time not only for relaxing with family and friends but celebrating the relationships we’ve forged and maintained over the year - and that includes our business relationships. Finding an original corporate gift is not always easy, but a hamper from MostlyManx is guaranteed to strike the right note with clients and colleagues alike. The MostlyManx shop in Nelson Street, Douglas, is packed to the rafters with high quality goods made by local artisans and producers. There's also a great range of bespoke gift boxes and hampers for both corporate and personal needs, tailored to suit all tastes and budgets. Putting together the perfect hamper couldn't be easier or more stress-free: you can either let our friendly, helpful team make the selection for you or create your own with instore items, or gifts purchased from other retail outlets. 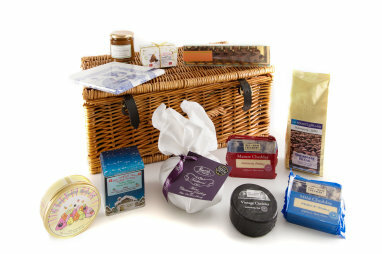 Alternatively, you can choose from a range of ready-made hampers, such as the 'Taste of Mann' hamper (perfect for foodies! ), luxury his and hers gift selections, and the 'Pamper Hamper', an assortment of gorgeous treats for bath and body, hand-packaged in Laxey Manx or Hunting Manx tartan print. Even four-legged friends have been thought of, with the inclusion of Manx-made 'Doggielicious' natural, gourmet dog treats. If you'd like to include fresh food in your Christmas hamper, you can choose from vacuum-packed Manx kippers, Isle of Man Creamery cheeses, smoked bacon and, new for 2012, kipper or salmon pate. Staarvey Farm and Sheila Gawne preserves and chutneys; confectionery from Cocoa Red or the Fudge Factory; pure Manx honey from Jerry Norton in Lezayre; Ellerslie oils; Green Mann Spring Water; and 100% natural juice from the Apple Orphanage are just some of the mouth-watering products you can send to loved ones, to ensure that their table has a taste of Mann at Breakfast, Lunch and Dinner. Once you've decided on your ideal gift hamper, MostlyManx will ensure that it is beautifully packaged and presented according to your wishes, down to the finishing touch of pretty, personalised gift ribbon. Corporate hampers can be customised with your company name or logo - simply supply the details and we'll do the rest. A tasteful hamper with such thoughtful touches is the ideal way to nurture good business relationships, while the contents can easily be shared and enjoyed between colleagues! The experienced team at MostlyManx will be more than happy to discuss your needs, ensuring that your corporate gift perfectly conveys your message. MostlyManx hamper prices start at £16.95 for a personalised gift box up to £179.95 for a luxury wicker hamper, which can be delivered locally, to the UK and overseas. Do be sure to place your order in plenty of time –our unpredictable winter weather can wreak havoc on freight transport to and from our Island community, so it's never too early to start making your arrangements. To find your inspiration, pop in for a browse next time you're passing and pick up the MostlyManx gift brochure and artisan directory. The sooner you choose your bespoke gift box or hamper for MostlyManx to deliver, the sooner you can sit back and enjoy a relaxing time as Christmas approaches. Not only that, but you'll be supporting local businesses and small producers and, most importantly, ensuring that your valued clients and colleagues receive a treat they'll truly appreciate. Let MostlyManx take care of things for you and we'll guarantee great-tasting gifts (and gifts of great taste!) with a memorable Manx flavour. Here's to a Happy Christmas and a prosperous New Year for everyone in the Isle of Man.